Along with losing weight, getting more done, simplifying your life and other commendable goals, is reading through the Bible one of your resolutions for the year? If so, I’d like to share a way for you to do it that will change your life more significantly than any diet will! Today we’re going t to talk about….. 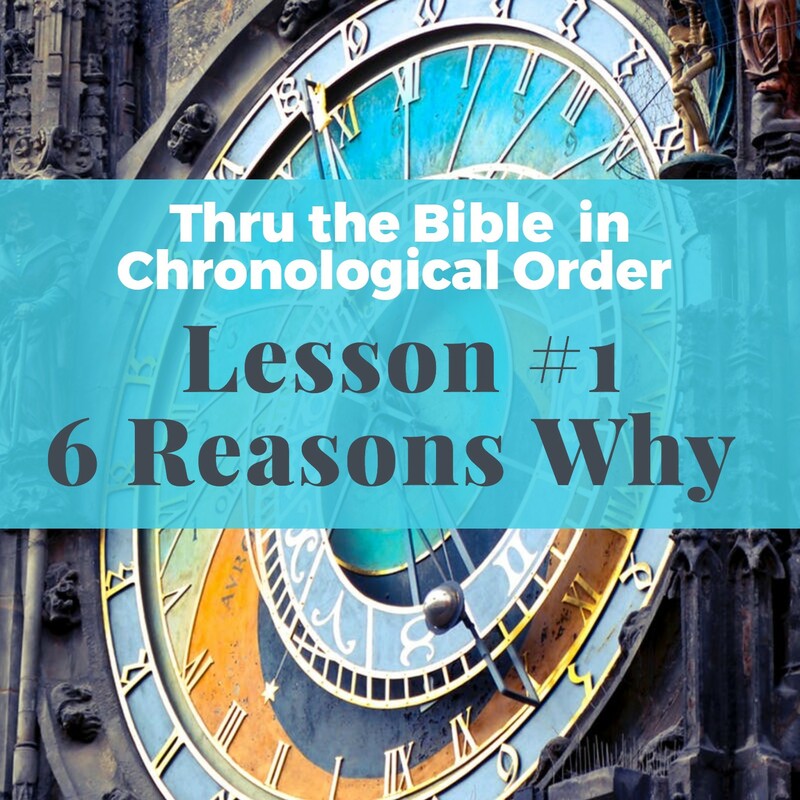 There are many ways to read through the Bible each year—but there is one that is by far the BEST way to do it (and I’ll be going into the reasons why it’s best shortly) and that is to read through the Bible in Chronological order. That means to read the books (or parts in some cases) in the order they happened, not the order you find them in the Bible. 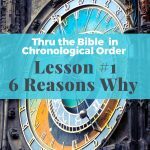 But for now, since reading through the Bible in Chronological order is a somewhat daunting task, it’s worth asking why do it? To answer, ask yourself, why read anything, watch any movie, learn any new information in a certain order? The answers are obvious. With the exception of the use of flashbacks or other literary devices, we need to read and experience events and character development in their natural time-dictated sequence for the story to make sense, for us to know the characters, and to care about what happens to them. In a non-fiction book we need to know the premise, the background, the arguments for the practical recommendations that follow for the message of the book to be something we want to follow. Jump into the middle of a Harry Potter story filled with Muggles, Quidditch, Dumbledore, and Hogwarts. Start watching The Wizard of Oz for the first time in the middle of the movie and see a young woman, a lion, a scarecrow and a tin man marching down a yellow brick road. Open a book on the Paleo diet find these terms: paleo/primal, autoimmune protocols, leaky guts, and ketogenic. All the above are nothing more than a confusing list of characters and terms if you don’t read the entire book or watch the entire movie each one is in, but they all make perfectly good sense if you read the entire book or watch the movie from start to finish and meet each term and character in context. We wouldn’t claim to know the least bit about the Harry Potter, or the Wizard of Oz, or the Paleo diet if we only dipped into a few pages of each book or minutes of the movie here and there, even if we had favorite pages we went back to again and again. If we did that we couldn’t honestly say we understand the world of Harry Potter or how a Paleo diet works. Have never read it all the way through? Or ever read it in Chronological Order? Though all Christians should read their Bibles regularly and many do, it’s easy to go back to the books and passages with which we are most familiar. But really loving Psalms and Proverbs and having read the Gospel of John several times, or reading a “Verse a Day” from your favorite devotional book doesn’t mean you’ve read the Bible. I don’t want to beat up on Christians who haven’t read their Bibles all the way through and especially haven’t read them in historical order because the way our Bible are organized today makes that extremely difficult to do that. In most Bibles, the books of the Bible are grouped by type: In the Old Testament: history, poetry, prophecy; the New Testament is similar: history, letters, prophecy. That grouping has nothing to do with chronological order. Why are they in the order they are in today? After researching many sources, some referred back to the way the Jewish Old Testament was organized, as the New Testament writers do when they talk about “the Law and the Prophets” the grouping of the Old Testament content they were familiar with. When the Old Testament was translated into Greek several hundred years before the time of Christ known as the Septuagint, it was organized into the genre categories of Law, History, Poetry, Prophets. The New Testament order is also based on subject or genre categories. First, come the historical books–the gospels and Acts. Then come the epistles–first those from Paul, then those written by the other writers. Revelation comes at the end. The human responsible for the current order of the books was Jerome, who translated the Latin Vulgate, based on the Septuagint genre organization. He did his work from around 390 to 405 AD. BTW the “Latin Vulgate” his translation, we tend to think of an esoteric, scholarly project—but it wasn’t! Most people at that time spoke Latin so he was translating it from the scholarly Greek and Hebrew into the popular language. And the term “vulgate” means “common.” He was writing a translation for the common people because at the time most people spoke Latin. When I tried to find out why Jerome and others organized books by type, I couldn’t find a good answer, but I suspect that when the books were arranged this way, the scribes and later the editors of various translations, from their great familiarity with the content of all the books, knew which prophetic writings were spoken during what king’s reign, which psalms David wrote at various times in his life, and what was happening in Acts to prompt Paul to write letters to various churches. Sadly, that isn’t true of most of us today. We may love Jesus, our church, and Christian friends, but many of us don’t have any idea what Amos was preaching about or when or the setting of how Cyrus fulfilled a prophecy Isaiah spoke about him 150 years before he was born. We can’t appreciate how Jesus fulfilled many prophecies in the Old Testament or the depth of his life and sacrifice as Paul explains to them because we have no idea of the Old Testament rituals and the sacrificial system he refers to. We sometimes don’t understand the parts, promises, and problems of individual passages because we don’t understand the big picture. But before we get to them, let me clarify something about listening to the Bible. Throughout most of the history of God’s people, few have had access to a printed Bible of their own to read. Through the centuries of the Old Testament, the New Testament times and most of human history until very recently, the way most people took in God’s Word by LISTENING to it. ONE—We’ll understand the whole story of salvation as it unfolds: for many of us, we only have bits and pieces of the story, but when you read it in chronological order you’ll see God’s extraordinary planning and working out of every detail over the centuries. You’ll see how the entire Bible builds towards the coming of Jesus, this death, resurrection, and promised return. TWO—We see how God is truly the author of the entire Bible: The Bible was written over 1600 years and yet it has one voice under all the voices and one clear theme—of God seeking, saving, and restoring his lost people. THREE—It will help us understand the uniqueness of the Christian Bible: no other religion has Scriptures written over a similar time period that is as internally consistent as the Christian Bible is. There are no other Scriptures that have historically verifiable prophecies that were fulfilled in verifiable historical settings as in the Christian Bible. These are bold statements and you must read the Bible in chronological order, along with an understanding of history to see them. FOUR–It will grow our trust and confidence in our God: the same God who mercifully clothed Adam and Eve after they sinned and promised them a Savior is the same God who formed Israel, guided, and disciplined it, and who from it brought his Son into the world and who lived, died, rose, and formed his church to carry his message of salvation and his return to restore all things. When you see that big picture and the sometimes difficult lives the Biblical characters lived in the midst of it, it can give you peace and trust to understand your part of the same great story. It will fill you with hope and assurance of our glorious ending when daily trials threaten to undermine your faith. FIVE—We won’t be disappointed with God: When we have no idea of the contextual meaning of the passage we pull out a promise or encouragement we like, interpret it in a way that makes us feel good, and then when God doesn’t do what we think he should (and that in reality he never promised to do) we get upset with him and wrongly assume he can’t be trusted. The book of Job is a great example of this because if you read passages by themselves of what Job’s friends say to explain his suffering, you’ll get a totally distorted picture of God. They talk about how God punishes people with suffering and rewards them with blessings based on their behavior—popular thoughts always when we aren’t the ones suffering and we want to judge someone who is. But the book of Job, if you read the whole thing, shows how wrong that thinking is. God was honoring Job, who he called the most righteous of men, before the hosts of heaven with the suffering he sent him. Job had no idea ever what was truly going on and at the end of the book, God tells him to pray for his friends because He (God) was angry with them because they were so wrong. But you see if you don’t read it ALL and read all the verses in context you won’t know this. One more thing about Job—when you read the Bible in Chronological order, you’ll learn it took place about the time of Abraham—and that has incredible implications……but that part of the story you’ll have to listen to the Podcast ahead to hear about. SIX—We won’t skip the hard parts that are essential to the complete story of God’s Redemption: We tend to go back to favorite passages instead of reading the entire Bible and in doing that we skip the hard parts. These are the parts that are not easy to understand, like Leviticus (but without understanding it, the sacrificial death of Jesus won’t ultimately make sense), or the difficult challenges of the minor prophets (who spell out what “to do justly, love mercy, and walk humbly with your God” really mean), or the exclusive claims of Jesus as the only way to God and what his death demands of those who follow him (why we are also commanded to take up our cross and are reminded we are crucified with Christ). Reading the whole Bible in Chronological order isn’t safe—it will shake and transform every part of your life if you will let it. But it’s good. So….. join me as we go through the Bible in chronological order in the coming year. You can download a copy of the reading schedule, on www.Bible805.com, plus a print copy of the text of this podcast if you’d like to share it with others. I’ll be doing at least one Podcast a week on it and you can subscribe to it on iTunes or any of the other ways you listen to podcasts. There is a list of them on the Bible805.com website. If you live in the Ventura, CA area join us for Bible 805 LIVE, on Sunday Mornings through 2019 at 10:30 in the Orchard Community Church Library, starting January 6. I’d love for you to join us. If you listen to this another year other than at the end of 2018 when I’m recording it, all the lessons will be available in the podcast archives. In closing, my most sincere prayer (and I am praying it fervently and often) is for you to read or listen to the Bible in Chronological in the coming year—your life will never be the same. Until next time, I’m Yvon Prehn, your fellow pilgrim, writer, and teacher for Jesus.